The first Migraine In America survey was conducted in 2012. Looking back at those results compared to those from 2018, we found a lot of similarities as well as some differences. While we cannot confirm that any of the survey participants were the same in 2012 and 2018, the number of participants has nearly doubled in 6 years. When we look at the results from both of these time periods, it is notable that 93% of survey participants were female in both years. The average age of participants in 2018 is 48 years old which is slightly older than the group from 2012. 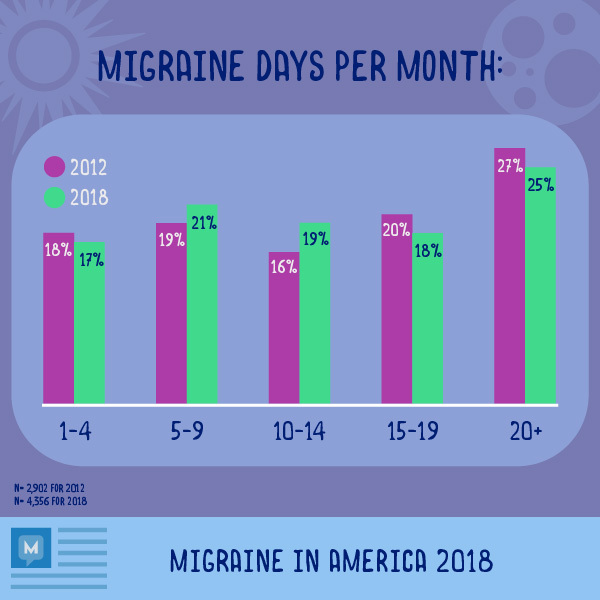 When comparing the 2012 and 2018 survey participants, the average number of migraine days per month differed only by one to three percent (1-3%). Essentially, this demonstrates that we are seeing a similar mix of episodic and chronic migraine patients taking the survey over the years. Of course, this does not mean that people may not have experienced an increase or decrease of migraine days over the years, only that the sample of participants is quite similar over the years with respect to the frequency of migraine days per month. 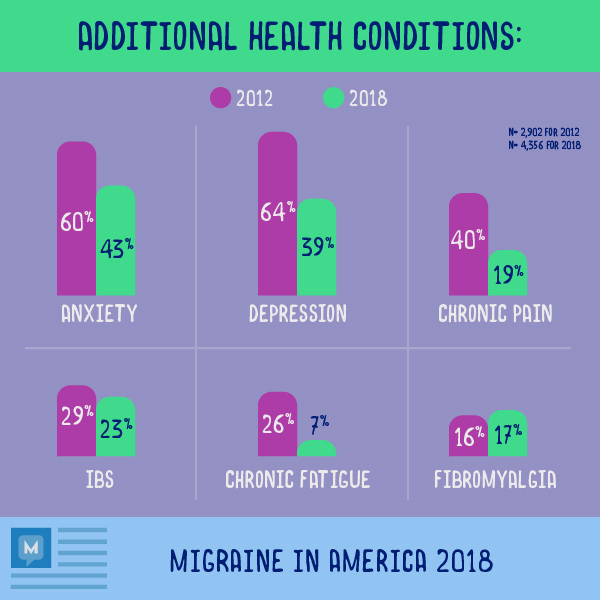 In 2012, 68% of survey participants were diagnosed with chronic migraine, compared to 71% in 2018. 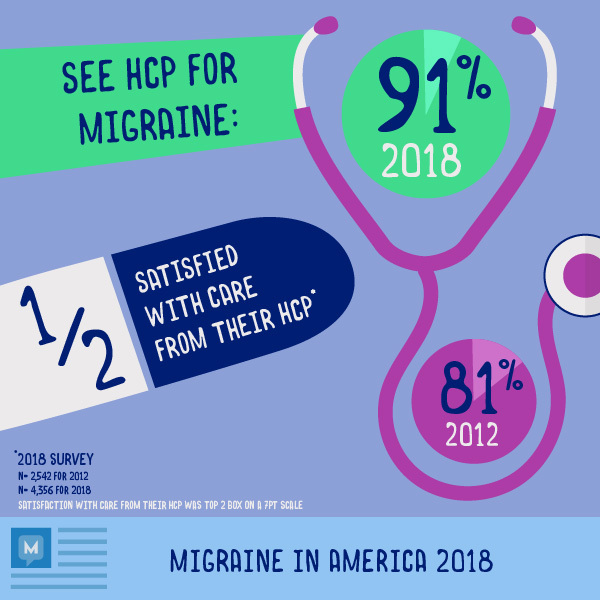 In 2012, 81% were seeing a health care provider (HCP) for their migraine, compared to 91% in 2018. We dug deeper in 2018, and learned that half of the survey participants are satisfied with the care from their health care provider. In addition, participants felt their HCP regularly discussed their quality of life when reviewing their current treatment plan. 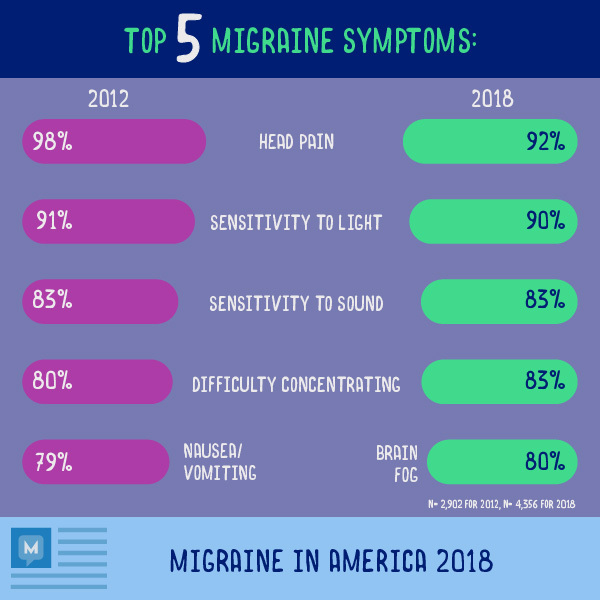 In 2018, head pain, sensitivity to light and sound, difficulty concentrating, and brain fog were the top five reported migraine symptoms. In 2012, instead of brain fog, nausea and vomiting made it to the top five. This makes us wonder if more people are simply more aware that brain fog can be a migraine symptom today compared to 2012. 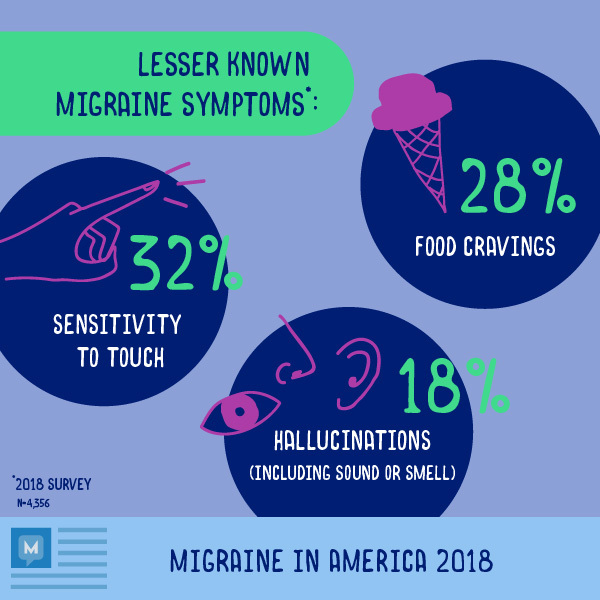 Over the years, Migraine.com has increased the number of symptoms, including lesser-known symptoms, that we ask about in the Migraine In America survey. These lesser-known symptoms include food cravings, sensitivity to touch, and hallucinations to sound or smell. When comparing the two time periods, we see fewer survey participants who reported a mental health impact in 2018 compared to those who reported a mental health impact in 2012. Despite this decrease, it is important to note that anxiety or panic disorders and mood disorders such as depression are still impactful health conditions for those with migraine. Other health conditions that top the list both today and 6 years ago include chronic pain, IBS, chronic fatigue, and fibromyalgia. In both 2018 and 2012, survey participants were asked to report their medication behavior over the prior 6 months. Comparing responses from participants in these two time periods, there are some notable differences. 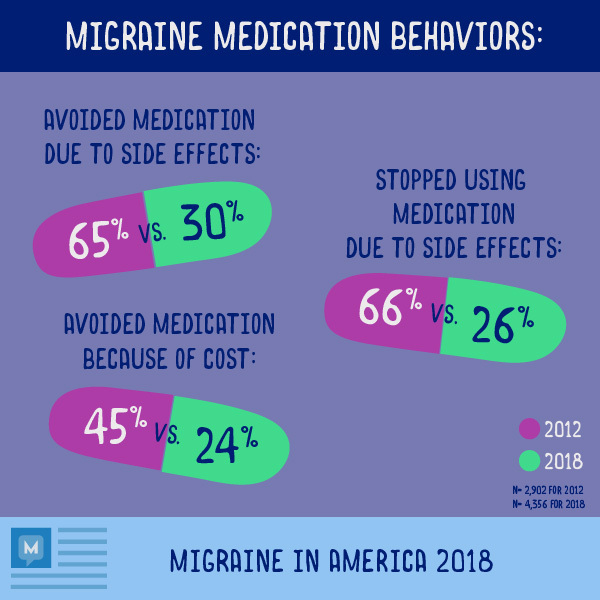 For instance, back in 2012, 65% avoided a migraine medication due to side effects compared to 30% in 2018. Also, 45% of participants avoided a medication due to cost in 2012 compared to 24% of participants in 2018. This year, we also asked which resources patients used to make their treatment decisions. Forty-one percent of survey respondents reported going online to read other patients’ opinions of a medication and 31% reported visiting a prescription medication’s website. This shows the increasing importance of online resources for people living with chronic health conditions. 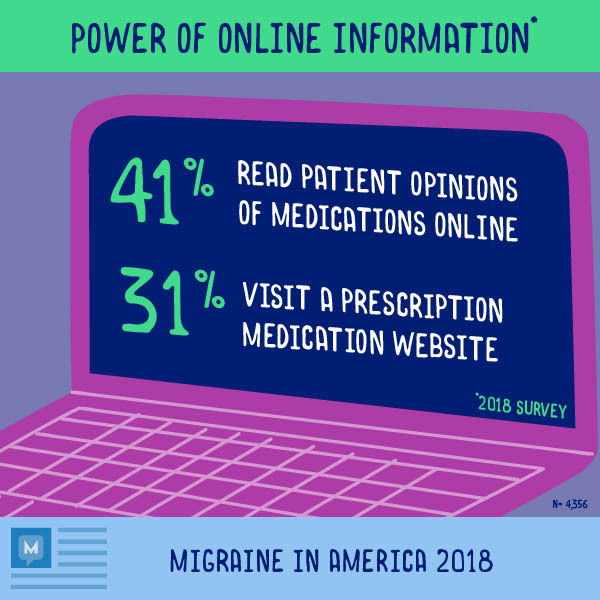 The Migraine In America 2018 survey was conducted online from March through May 2018.